Personal Injury Attorneys Serving Los Angeles, Riverside and San Bernardino counties for over 20 years. It can take a long time to recover from the physical and emotional effects of an accident. When accidents have been caused by the negligent or reckless conduct of another party, there is also a legal recovery process that may take several months or years to complete. A personal Injury attorney can help. Whatever help or resources you and your family need to recover, however long it takes to get there, no law firm will show you more compassion, work harder for you or fight harder and more relentlessly on your behalf than the personal injury attorney at the Law Offices of Eslamboly Hakim. Call our Beverly Hills office at 800-LAW-TALK (529-8255) to schedule a free consultation. Evening, weekend and out-of-office appointments are available on request. No matter how nice the insurance company representative seems, how reassuring his or her promises sound, or how attractive that quick settlement offer looks, make no mistake — the at-fault party’s insurer is looking for a way to minimize its losses at your expense. Our extensive experience dealing with accident-related claims and legal issues levels this playing field and forces the insurance company to deal with us instead of you. It’s important that you seek appropriate medical care as soon as possible after an accident and also to you follow your health care provider’s treatment recommendations. 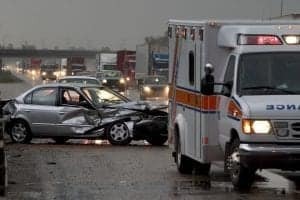 If you delay or don’t follow your doctor’s orders, it may enable the insurance company to successfully argue that your injuries weren’t actually caused by the accident in question or that your own actions made those injuries worse. In effect, this could severely limit the amount of compensation and may even preclude any recovery at all. If necessary, our firm can make sure that you have access to the medical care and treatment your injuries require. We do this by connecting you with respected health care practitioners who treat patients on a medical lien basis. This means they will be paid for their services out of any settlement or verdict that we secure on your behalf. Personal Injury Claims – What Are The First Steps? Schedule a free initial consultation with an experienced personal injury attorney from the Law Offices of Eslamboly Hakim. Call 800-LAW-TALK (529-8255) or contact us online.